To view the Group Piano Schedule click here. 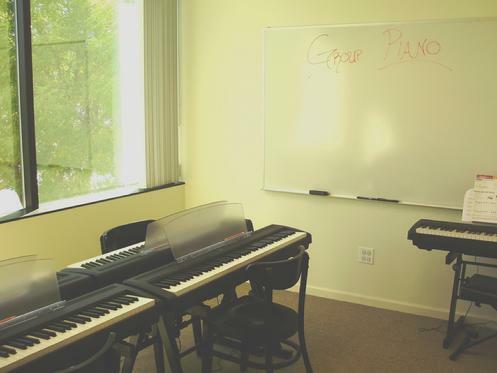 For many people, the easiest way to learn piano is in a group setting. Beginners often find group piano classes less intimidating. They like learning with other students who are the same age and at the same level. The teachers use proven, age appropriate teaching methods that are easy to understand & make learning piano fun. Ages 3 - 4 - This is a 30-minute class designed for ages 3 - 4. Beginners - This level is for beginner students with little or no experience. Level 1 – Students know note names on the keyboard, can solve note names on the grand staff, know basic rhythms, and use correct hand position. Level 2 - Students are proficient at note names on the grand staff, proficient at sight-reading easy 5 finger position pieces, knowledge of more advanced musical notation. These students are ready for private lessons but prefer a group setting. The teachers use proven age and level appropriate teaching methods that are easy to understand & make learning piano fun. An affordable alternative to private piano lessons. Preschool piano classes for ages 3 & 4 start. Save $183 when compared to private piano lessons. Come check out our piano lab - complete with 5 Yamaha pianos! The piano lab has huge windows - no dark, windowless, basement rooms here - and plenty of space to learn in our jumbo size class room! Need a place to practice? All group piano students are welcome to use The Academy of Music and Art's piano lab for practice time at no additional charge.